The first round of the 2019 Masters is in the bag, and the second round is now well underway. Tiger went 2 under in round 1 (70), which is what he shot in the first round in 3 of his 4 Masters victory’s first rounds. But it was Bryson DeChambeau and Brooks Koepka who turned on the afterburners on the back nine at Augusta National, both rolling in at 6 under. DeChambeau’s back nine was a sight to behold, inches away from making an ace on the par-3 16th, hitting a chip-in on 17, and hitting the pin on his approach at 18, and making six birdies on the back 9, and four of those in a row on the last four holes. Studying all those black holes in physics paid off, as DeChambeau’s ball was finding plenty of them on Augusta National. Today, Francesco Molinari (one of my picks to win) has snuck up the leaderboard to 5 under, just two back from DeChambeau, who’s now 7 under through 8. There’s still a lot of golf to be played. If you’re looking to catch up an individual golfer’s round, you can now go to Masters.com, click on the leaderboard, hone in on any given hole for any given player, and watch video of every shot on the hole. It’s another game changer for golf fans, because if you want to watch the progression of a player to come from out of nowhere, there’s really no other way! Okay, of the players I put in my top box of likely winners, it’s Brooks Koepka, Molinari and Dustin Johnson who are hovering towards the top of the leaderboard. But like I said, lots of golf to be played, and possible weather yet to move in over the weekend. My nerves are a wreck. Congrats to Captain America (Patrick Reed) on winning his first major at Augusta National yesterday! Reed went into the final round at -14, and ended at -15 — but it was enough to hold off late charges from 2015 Masters winner Jordan Spieth, and Ricky Fowler. It was another dramatic final round at The Masters, and one that kept golf fans around the globe on the edge of their seat. Reed was paired with Rory McIlroy for the final round, after Rory turned in a 69 on moving day to enter Sunday just three strokes behind Captain America. And after having witnessed that tremendous Ryder Cup singles pairing at Hazeltine in 2016 between Reed and McIlroy (which Reed won 1 up), expectations were high for this final round. But Reed refused to concede any ground, and Rory just couldn’t get it going on Sunday — his Grand Slam will have to wait. Let’s get the most important stuff out of the way first. Tiger tees off in the first round of this year’s Masters at 10:42, grouped with Australia’s Marc Leishman and England’s Tommy Fleetwood. You can feel the Augusta Tiger buzz all over the world (okay, the golf world, anyway). But enough golf, let’s talk IT spending. Volatile? Amazon has lost more than $50 billion of market value in the last week, Facebook somewhere north of that. What’s driving the increase? First, the cloud. The report “found that IT budgets at these firms are set to increase 5.4%, slightly up from 5.2% last year, and that “budget gains are being driven by ongoing growth in cloud computing.” It suggested that 25% of total application workloads will be running in the cloud by the end of the year (up from 20% today). Cloud was one priority spending area, and security software was cited as another. Fifty-nine percent indicated they “do not expect changes in tax rates, appreciated depreciation, and cash repatriation” to impact their 2018 IT spending plans, and 29% indicated the tax changes would likely put upward pressure on spending. A Gartner forecast from earlier this year had projected estimates of IT spend to reach $3.7 trillion in 2018, a YOY increase of 4.5%. And this year’s tournament at “The National” is primed to be a doozy. Tiger Woods is back, and has already been on the prowl in a couple of recent tournaments. Bubba Watson and Phil Mickelson, both lefties with an advantage at Augusta National and previous Masters victors, have won prestigious PGA victories in recent weeks with some fantastic golf. Rory McIlroy also won recently, the Arnold Palmer Invitational at Bay Hill. All these previous winners have been peaking, not to mention Ian Poulter who just snuck in the back door of this year’s tournament by winning last weekend’s Houston Open in a playoff with Beau Hossler. That was, by the way, Poulter’s first stroke-play victory in the U.S. ever. Jordan Spieth, who led the field in Houston in strokes gained tee-to-green this past weekend, and a previous Master’s winner in 2015. Justin Thomas. Won the Honda and is the FedExCup leader going into this week. My point is, there are some seriously great and motivated golfers heading into this year’s Master’s. I’m not going to pretend to predict a winner, but if you had me pick a top four at this point, it would probably include Bubba, Phil, Tiger, and Jordan. But honestly, there’s so many great players playing so well…well that’s why this year’s Masters is primed for some serious golf! I joked on Facebook last evening that I was going to have to pay a visit to my cardiologist after watching the dramatic finish to this year’s Masters. Sunday at the Masters has become a timeless classic when it comes to drama, and whether or not you’re an avid golf fan like me, if you sit down and pay just a wee bit of attention, there’s something in it for everyone. This year, especially, there was plenty in it for all my friends down under in Australia, and so I want to first congratulate them, and their first green jacket winner, Adam Scott. After Scott’s majors breakdown in The Open last year, it was great to see Scott finally reach down within himself and come out the victor. Not to mention what I can only imagine means a huge deal in sporting Australia, where Aussie golfers like Greg Norman who, though never grabbing their own green jacket, inspired a whole generation of young and brilliant golfers like Jason Day and Adam Scott. As it turned out, there was plenty of drama throughout the weekend. Chinese 14 year-old phenom Guan Tianlang received a one-stroke penalty on Friday for slow play and still went on to win low amateur (we’ll be hearing plenty from Mr. Guan moving forward, I’m sure), and Tiger Woods incurred a two-stroke penalty after an illegal drop on 15 on Friday, after his brilliant approach shot hit the flagstick and bounced backwards into the water. Give Tiger that birdie and back the two strokes he lost on the bad drop, and yesterday’s outcome might have been very, very different. But in the end, it was a Masters that more than lived up to its name, and kicks of the year’s golf majors with the kind of compelling golf that simply leaves you wanting more. Even if it is bad for one’s heart. The Masters Leaderboard Is Live! That’s it, today’s the day. The first players have already teed off at the Masters in Augusta. Yesterday, I discussed the virtual means by which you could experience playing at Augusta National. Today I’m going to focus on the various means by which you can follow this year’s action on and off the course. First, and most importantly, the leaderboard. On the Masters web site, for which IBM is the longtime technology sponsor, you can go to the virtual equivalent of the traditional Masters leaderboard. 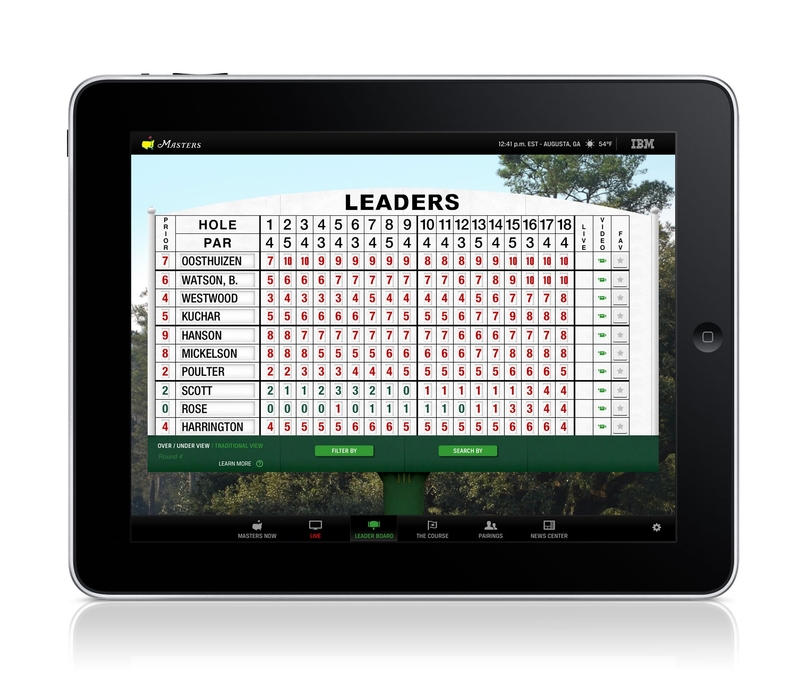 You can also find the leaderboard on this year’s revamped iPad app, which I’m quickly leaning on as my 19th hole for following all the action from Augusta. This year it includes live video from a number of the holes, including Amen Corner, 15, 16, as well as two “featured groups,” a Masters “in-depth” feature channel, and for those warm-ups, the driving range, and over the weekend a live simulcast of CBS’ TV coverage. You’ll be able to access live radio, news features, and pictures from the grounds (including new 360 panoramic images that I suspect will be suitable for framing!). As for TV coverage itself, that doesn’t start in the U.S. until 3:00 PM EST ESPN. However, live video coverage begins on Amen Corner starting at 10:45 AM on the Website and via the mobile applications, so if you’re hankering to get out to the action, that’s going to be your fastest way in. This year, IBM is leaning heavily on its SmartCloud technology to help drive quality and continuous operations, along with the flexibility and scalability required by the Masters. As players peak on the course, we typically see a resultant workload increase in our technology systems. This helped lead to have the need to provision a new Presentation Services “instance,” for example, in less than 3 minutes using Tivoli Provisioning Manager, as it helps us get new virtual machine instances up and running quickly. We are also able to move one workload to another on our POWER systems powering the Masters using our Live LPAR mobility in four minutes without service interruption. Can you say pressure putt??? So as the tournament begins, who will I be keeping a close eye on? Tiger, for sure. Phil. Brandt. Rory. Graeme. Garrigus. Schwartzel. Colsaerts. Poulter. Oosthuizen. Guan (the 14 year-old Chinese kid). It’s just an incredibly talented field, as, of course, it always is. Length and shot shaping are always helpful at Augusta, especially right to left, but as Zach Johnson proved several years ago, shorter hitters can score (and win) if they play the right angles. As for me, I went back and played another virtual round at Augusta last night in my Tiger Woods PGA Tour 12 and shot 2 under. Turbo tees off at hole number one at Augusta National, where The Masters has been played most every year since 1934. Only in this case, Turbo has gone all Neo and is playing the Tiger Woods PGA Tour 2012 virtual edition of the course on his Macbook Air. He figures its the closest he’ll ever come to playing the real course. It’s Masters week, if you hadn’t already figured that from all these golf- and Masters-related golf posts. I’ve never had the honor of visiting or playing Augusta National myself, but I know people who have. He also explained, as I’ve also heard from others, that TV just doesn’t do the course justice. He explained that the hills and undulations are so much more pronounced when you’re out there walking the grounds. “Eighteen,” he explained, me nodding my head. “Like walking straight up a hill.” On TV, it obviously looks like it’s uphill, but not nearly the angle at which he was suggesting. It was at this point that I had to tune out, as he was killing me with this reveal. So yesterday, after work, I decided I wanted to get to know the course better, and figured why not try and see if there were any golfing games that included Augusta National in their course lineup. I figure this is the only way I’m going to play some of the world’s great courses, so it’s probably a pretty good investment. 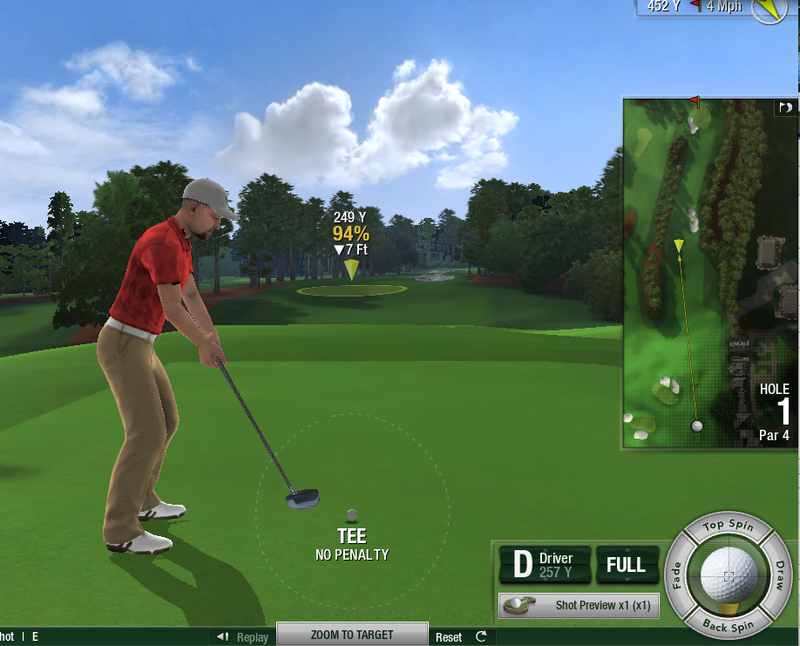 Turns out, Electronic Arts had released a Tiger Woods PGA Tour 2012 edition in that year that included the ability to play Augusta National, and they had a Mac edition, AND Amazon would allow me to download it on the fly and install it. All for a whopping $20. I also discovered the 2014 Tiger Woods PGA Tour edition will have a version of Augusta for the Masters in 1934 — so not only can you play with the likes of Bobby Jones and Ben Hogan and all the other greats, but you can play the course the way Bobby Jones and Alister Mackenzie originally designed it. The 2012 version will do nicely for now. Once the DMG was downloaded and I had installed the software and got the online presence set up (the game allows you to play a round with others out in cyberspace), I was off to hole number 1, Tea Olive (see pic above). My score for the round was atrocious, as I was just learning all the controls for shotmaking in the game (that’s my excuse and I’m sticking with it), but the visualizations and greenery were an excellent way to find your way around the course, and to help you better learn how and why players navigate Augusta National the way they do. For the record, on number 12, I hit about five balls into Rae’s Creek before finding the green — hopefully not a prophecy of things to come should I ever get to actually play a round at Augusta National. I also found myself in situations that most Tour players would never find themselves which, for me, is about par for the course.